REGISTER on FlexoJobs.com, then post your resume. Post your jobs starting at $95 for 95 days/one job. Reduced pricing for multiple jobs. Add links to your company’s online job application or accept inquiries via email. Browse candidates and resumes and reach out to them directly - their contact info is included, along with detailed resumes, if the candidate has chosen to provide one. Include a company profile with description and logo to be featured on our home page whenever you have an active job posting. 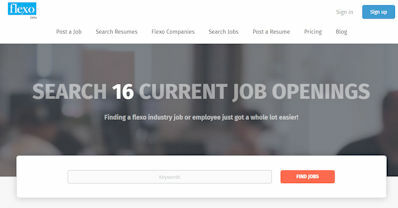 Get started, register on FlexoJobs.com! DO YOU NEED FLEXO PRESSROOM TRAINING, CONSULTING? On-Press Troubleshooting | On-Site Press Operator Training: in your shop, on your equipment! Temporary Press Operators - Keep your press running while you search for a permanent operator. Work off your excess ink inventory.